I hope you find great value in these Quotes about Morality from my large collection of inspirational quotes and motivational sayings. Reverence for life affords me my fundamental principle of morality. to reason and is in conflict with morality. and truth is the substance of all morality. but for us, not for God. Force always attracts men of low morality. and that 99 % of them are wrong. Art, like morality, consists in drawing the line somewhere. more criminal, than our glorified sacred function of motherhood? not by morality but by exhaustion. successful business stands on the foundation of morality. of a man or woman has not much to recommend it. Morality is rooted in the purity of our hearts. Morality and expediency coincide more than the cynics allow. A novel that does not uncover a hitherto unknown segment of existence is immoral. Knowledge is the novel's only morality. is antecedent to religion-it even exists in a rudimentary form among animals. have historically evolved as religious issues. their past history and morality? standards of personal morality and integrity. the morality, the justice, and the interest of the people themselves. rules of morality and good taste. incubator is the mother of a chicken. and illegal abortions and unwanted children. but a way of wasting some force, an enervation. than there has been before. of superior sensitivity and morality. is based upon basic morality as well as enlightened self-interest. Our role in supporting Israel honors our own heritage. other platonic absolutes of say beauty and morality. They can't impose morality on themselves. How can they impose it on the country? He was as great as a man can be without morality. her a leading figure in our nation's civil rights history. plays in which good triumphs over evil. as actions to an individual, but permitted to a mob. I don't believe in morality in architecture. He was a crystal of morality among our scientists. The rules of morality are not the conclusion of our reason. when the sense of curiosity has withered. There is no morality by instinct. without mastery of logic and application of logic to human experience. 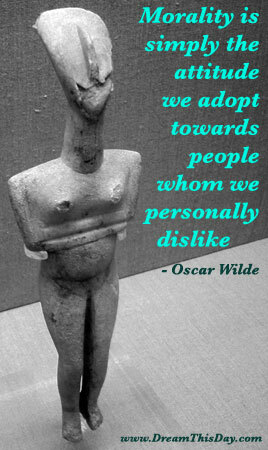 None of us can boast about the morality of our ancestors. The record does not show that Adam and Eve were ever married. There is a crisis of public morality. a better job policing boardrooms. Chaperons don't enforce morality; they force immorality to be discreet. just to create chaos for news cameras. the door to every kind of tyranny. But the relationship of morality and power is a very subtle one. Because ultimately power without morality is no longer power. Morality is a venereal disease. boredom; its tertiary stage, syphilis. that it practically drives out of existence the moral forces? them fighting drunk on bogey tales. I have always maintained that society has no business dictating morality. Try to find the path of least resistance and use it without harming others. Live with integrity and morality, not only with people but with all beings. and then lust not to follow. Therefore the great mediator of any community is human morality. The test of the morality of a society is what it does for its children. not to suffer and die, but to enjoy yourself and live. Morality is only moral when it is voluntary. Whether they are true or not is irrelevant. Thank you for visiting: Morality Quotes.